Here’s a unique perspective of the Owl Panel located near Moab. This photos shows the main portion of the panel that includes the precision-carved owl petroglyphs along with a much larger life-sized anthropomorph. 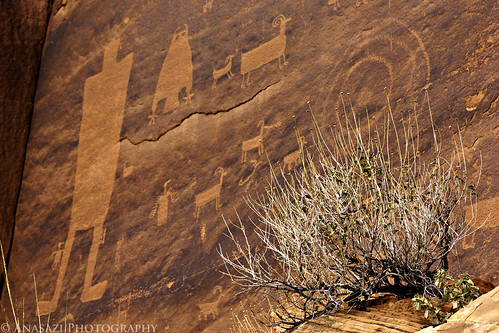 There appears to be two smaller bird-like figures and, of course, plenty of your typical bighorn sheep, too. This is an awesome panel that I really need to get back to again soon.